The long jump, or broad jump, as it is also known, is an obstacle not frequently used in dog competition, but it is one that people often forget. The length of the long jump is based off a dog’s height, with the required distance being double the dog’s height. The long jump takes a bit of practice and skill for a dog to complete, but requires only a few parts to construct. Measure your boards. You will need to have one board that is 60-inches long, one that is 56-inches long, one that is 52-inches long, one that is 48-inches long, and one that is 44-inches long. Once you have measured and marked your boards, cut them to those lengths. Take your remaining scraps of lumber to construct the legs of your jumps. 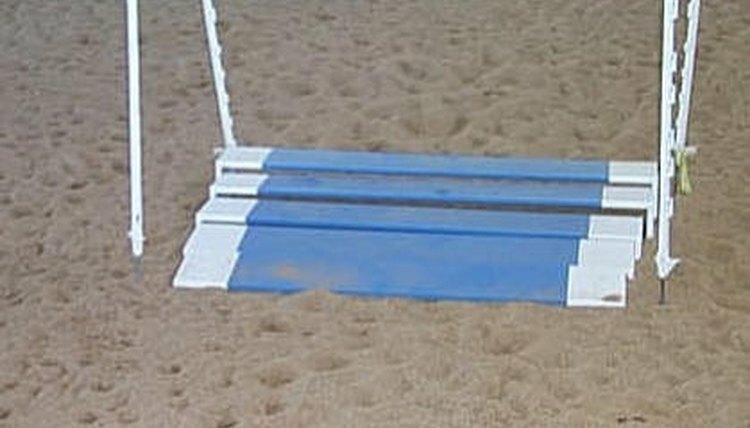 The legs of the jumps will need to be flat on the bottom, but angled to be taller from front to back. You will need a pair of legs for each of your boards, with the longer board requiring the taller legs. Measure your pieces of lumber for the leg pairs. Your first pair of legs will need to be 6 ½-inches tall at the low point and 8-inches tall at the high point. The second pair of legs will be 5 ¾-inches tall at the low point and 7 ¼-inches inches tall at the high point. Your third set of legs will be 5-inches tall at the low point and 6 ½-inches tall at the high point. The fourth set of legs will be 4 ¼-inches tall at the low point and 5 ¾-inches tall at the high point. Your final set of legs will be 3 ½-inches tall at the low point and 5-inches tall at the high point. Cut your leg pieces according to the dimensions needed. Cut them at an even angle so that they attach firmly to your boards, and cut the bottoms flat so that they rest evenly on the ground. Place one of your tallest leg sections under the edge of your longest board, and screw them in securely. Repeat this with the other end of the longest board, so that you have both of the tallest leg sections connected to the longest board. Continue screwing your leg sections to their corresponding jump board panels, with the next tallest leg sections connected to the next longest boards. Once you are finished with this process, you should have 5 progressively taller jump panels. Paint your long jump panels. Typically broad jumps are white in color, and must have a contrasting color stripe in the middle. The contrasting color stripe must be at least 3-inches in length across the center of the board, so be sure that you measure and paint them accurately. Any color is fine, as long as it is a good contrast to the white base of the boards. At this time you can also sand down any rough edges, and check for any protruding hardware on your jump panels. Set up your jump panels according to your dog’s height. The shortest panel comes first, with the taller panels placed progressively behind the first. Your jump distance needs to be twice your dog’s height, so if you have a 20-inch tall dog, your jump will need to be spaced to 40-inches. You can take your measuring tape and mark evenly spaced spots for your jump panels as necessary for the height of your dog. Check to make sure that your jump panels are secure and evenly spaced. They should not rock or move, and should be set on an even section of ground. You can now work with your dog to perfect his performance of the broad jump. Be sure the paint dries before you attempt to move or handle your jump panels. You can nest your jump panels inside each other when they are not in use. This will save space when in storage. Do not paint in a closed-in area. Paint fumes can be very hazardous to humans and animals alike.